While dedication and interest in commercial real estate have provided a strong foundation for his success, perseverance has really paid off for Andrew Monette, associate advisor with Pinnacle Real Estate Advisors, LLC. “Every senior broker you ask will tell you same thing – you need to consistently be making phone calls, lots of phone calls, and you will never really stop prospecting for clients,” said Monette. Monette joined Pinnacle as a research intern in 2013. 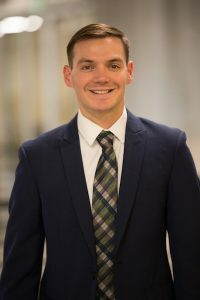 After a twelve-month internship, he was promoted to database manager and in 2016, was promoted to being a transaction manager on the Johnson|Ritter Team. At the beginning of 2017, Monette then moved into the role of associate advisor on the Johnson|Ritter Team. “The best advice I could give to a broker just getting their foot in the doors is to persevere. Like I did, they are very likely to go home on some days wondering if this is even the right thing to be doing, but with hours of hard work with their nose to the grindstone, eventually the ball they’ve been pushing up hill will reach its pinnacle!,” he said. A vivid and defining moment in his career came the day Monette and his team closed on a $9,375,000 mixed-use property, one of only four deals he had personally sourced at that time, and the biggest deal of his career. Maintaining his mental toughness has consequently been a challenge for him but the lessons he has learned during the early years of his career have enabled him to grow stronger and become a much better broker. The positive impact he has seen in the surrounding community is evident through his clients’ pride of ownership. Without question though, the transaction Monette is most proud of is a recent 1031 Exchange for an amazing retired Denver firefighter whom spent years working his way up from owning a single-family home as an investment to now owning a portfolio worth tens of millions of dollars. Monette is originally from California and moved to Denver in 2008. He earned his B.S. in Business Administration from the University of Wyoming.